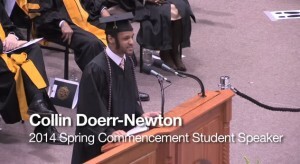 Student speaker Collin Doerr-Newton, a sound design major who was chosen to speak after submitting and reciting his speech to a panel, likened Michigan Tech to a piece of music. Originally from Lansing, Doerr-Newton said that he frequently encounters the idea that everyone at Michigan Tech is the same. They are, he agreed, just as much as they aren’t.